Drs. 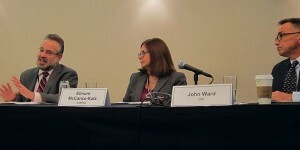 Ron Valdiserri, Ellie McCance-Katz, and John Ward dicussing federal viral hepatitis initiatives with Viral Hepatitis Prevention Coordinators from across the country.Last week I had the opportunity to discuss the federal response to viral hepatitis with some of our key allies in the states: the CDC-funded Adult Viral Hepatitis Prevention Coordinators). These individuals lead health department efforts to coordinate activities directed toward prevention of viral hepatitis infections and integration of viral hepatitis prevention services into health care settings and public health programs (e.g., STD, HIV, immunization, correctional health, substance abuse treatment, prevention services for persons who inject drugs, etc.) that serve adults at risk for/living with viral hepatitis in most states, several cities, and the District of Columbia. These are often the only health department staff members tasked with hepatitis C (HCV) prevention. They serve as viral hepatitis champions within their health departments and regularly demonstrate great creativity in leveraging other programs and resources to expand the reach and impact of their efforts. During my presentation, I highlighted a number of successes since the release of the Action Plan for the Prevention, Care and Treatment of Viral Hepatitis in May 2011. These included the alignment of the CDC and U.S. Preventive Services Task Force (USPSTF) recommendations for HCV testing, cross-departmental efforts to address potential discrimination against health professions students with hepatitis B (HBV) infection, and raising awareness of the emerging epidemic of HCV among young persons who inject drugs. I also provided details on our ongoing work to develop a three-year renewal of the Action Plan that will cover 2014-2016; the updated Action Plan will be released during the first quarter of CY 2014. I shared with the Coordinators that as we work with our federal partners across the Departments of Health and Human Services, Housing and Urban Development, Justice, and Veterans Affairs to develop the renewed plan, we are striving to make it more accessible to non-federal partners so as to foster greater engagement with state and local health departments, non-governmental organizations, professional societies and other key stakeholders in the public and private sectors. We recognize the need to bring in “more muscle” to help implement the Action Plan. Joining me in the conversation about federal activities were my colleagues Dr. John Ward, Director of CDC’s Division of Viral Hepatitis”, N Engl J Med 2013; 368:1859-1861. May 16, 2013). A key action to be taken to improve that outcome is working with the Coordinators and other stakeholders to educate more healthcare providers and the general public about HCV. Among the recent CDC accomplishments that Dr. Ward highlighted was the publication of a simplified HCV testing algorithm in May 2013 and two successive years (FY12 and FY13) of special funding from the Prevention and Public Health Fund and the HHS Secretary for hepatitis testing. Throughout the two-day meeting, members of the Office of HIV/AIDS and Infectious Disease Policy attended and presented during various sessions at which the Coordinators shared their successes, best practices and challenges with one another. These sessions explored a variety of topics important to achieving the goals of the national Viral Hepatitis Action Plan, such as addressing the disproportionate impact of HCV among “Baby Boomers”, working with jails and prisons to screen for HCV, strategies for increasing HCV testing, addressing hepatitis in communities of color, reducing injection-related HCV transmission, and public health and community health center collaboration to improve viral hepatitis diagnosis, treatment and care. I was pleased to spend time with these important allies in our national efforts to combat the silent epidemic of viral hepatitis and look forward to continuing to collaborate with the Viral Hepatitis Prevention Coordinators as we advance our efforts in the coming months and years.